Der Artikel Love: Reel To Real (remastered) wurde in den Warenkorb gelegt. High Moon Records presents the 1974 studio album from one of rock music's most gifted and enigmatic legends back on vinyl after 40 years! 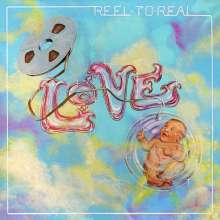 Reel To Real captures Arthur Lee and Love at the peak of their rock / funk / soul powers. Originally released in 1974 on RSO Records, this deluxe reissue features over 74 minutes of vibrant, remastered audio from the original multitrack tapes, a 32- page booklet with an illuminating essay by Rolling Stones David Fricke, and a trove of candid, unpublished photos. What Arthur Lee began on Love's Black Beauty (released by High Moon to wide acclaim in 2013), he brought to fruition on Reel To Real. Armed with a major label budget, and a powerful, intuitive band, he dug deep into the blues, soul, and rock grooves that first inspired him, reaching out to a new audience with his fierce and forward-thinking personal vision. To a palette of stinging guitars, explosive brass, deep funk bass and clavinet, splashes of spacey synthesizer, and dream-team female backing vocals, Arthur Lee brought his funkiest and most soulful collection of songs, and channeled the most visceral vocal performances he ever committed the best to tape. High Moon Records has unearthed 11 revelatory, previously unreleased tracks from the original sessions including alternate takes and mixes, live-in-studio rehearsals, and 4 newly discovered Ar thur Lee originals! This ultra-rare bonus material fills out the picture of a fearless, agile and very funky ensemble, led by a masterful singer-songwriter at his feral, exultant best!